Vagabond Inn Convention Centre Long Beach, located at 150 Alamitos Avenue, is sure to fulfill your needs when looking for clean, comfortable lodging in the Long Beach, California area. With a convenient location just minutes from Hwy 405, Hwy 110, Hwy 710 and Hwy 605, it is possible to access almost any part of the city with ease. Downtown Los Angeles is only a half-hour drive away, straight up Highway 110. When it comes to a wide variety of nearby attractions, the Vagabond Inn offers close proximity to many great destinations. For instance, the Long Beach State Beach is only one block away, offering great beach strolling and Rosie’s Dog Beach (pets can stay at the motel for an additional $10 a night!). If you are attending an event at the Long Beach Convention and Entertainment Center, it is a quick three-minute drive and less than a twenty minute walk from the hotel. The Long Beach Aquarium of the Pacific boasts nineteen major habitats and thirty-two focus exhibits, and is a mere mile away. If you’re an art lover, you’re in luck! The Long Beach Museum of Art is located less than two miles away on Ocean Boulevard, offering a changing array of exhibits, all overlooking the Pacific Ocean. Four farmer’s markets run year-round, with vendors offering seasonal goods including produce, meat, eggs, and other local delights. Of course, if the Long Beach Grand Prix is your destination, you’ve found the perfect place to rest your head after a long day at the races. Shopping and restaurants lie nearby, including Shoreline Village with its unique boardwalk shops. The Long Beach Towne Center offers a wide range of shops and a movie theater and promenade. The city is full of fantastic stores and boutiques, sure to have exactly what you’re looking for. Restaurants abound, with small cafes to large chain eateries to fit every gastronomical desire. The Vagabond Inn Convention Center Long Beach rises three stories with a total of sixty-one rooms. The outdoor swimming pool welcomes swimmers and loungers alike, with chaise lounges and umbrella-covered tables. Every clean, comfortable room comes standard with air conditioning and cable television and free Wi-Fi. In-room safes keep your valuables secure while you’re out and about. Parking is never an issue at the Vagabond Inn; each room includes a free parking space for one vehicle. Toiletries are included in each bathroom, lest you forget your own at home. Hair dryers are available upon request. With the in-room safes, it’s simple to keep your valuables secure. A complimentary continental breakfast is offered every morning, with coffee and tea in the lobby around the clock. A family-friendly option, kids under 18 stay free with parents. Traveling with your baby? Baby cots are available upon request, to make your stay more enjoyable. Traveling with your canine companion? Dogs are welcome to stay at the Inn for an additional $10 per night, with a maximum of four nights. When you’re seeking a budget-friendly hotel with a wide range of amenities and close proximity to so many of the main features and attractions of Long Beach, the Vagabond Inn Convention Centre Long Beach is a perfect choice. 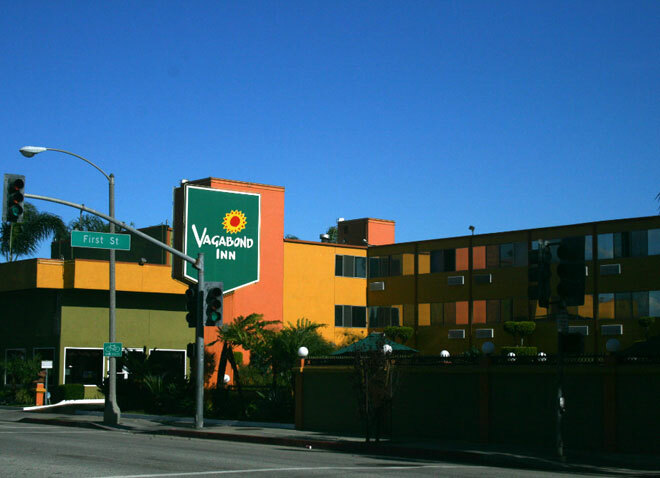 Vagabond Inn Convention Centre Long Beach, located at 150 Alamitos Avenue, is sure to fulfill your needs when looking for clean, comfortable lodging in the Long Beach, California area.